You might be the greatest professional your industry is yet to discover. And you might even excel at talking about your business and selling your skills as you network. But there’s one aspect of the job interview that can elude the best of us: small talk. It may sound like, well, a little thing. But small talk can be a deal-breaker when you go for a job and your potential boss is only 99% sure you’re right for the gig – or they have you measured up against somebody with similar strengths and experience. In that case, what they’ll prioritize is something that all employers value: work with ability. How pleasant you are to have around. Your attitude to life and to other people. Unfortunately, you may have the rosiest of outlooks on life, you may be the most peopliest person of them all. But if you tend toward the introverted end of the sociability scale, conveying your good nature to a panel of strangers can be like forcing a square peg into a round hole. Some people are naturals at small talk. Lucky them. But lucky you, because boffins in behavioral science have observed these people and figured out what works. Small talk may be an instinct for some, but for the rest, it remains an attainable skill. Of course, you’ve already been told to make eye contact while being grilled on your professional attributes. But that eye contact should begin the moment you get in the door. Using the triangle trick – keeping your eyes fixed on a triangle between a person’s eyes and mouth – will help you to keep engaged while they’re talking, and to follow little cues as to the direction of the small talk. It will even make it feel, to the other person, like you’ve said more than you really have because they’ll go away with the impression of having connected with you. 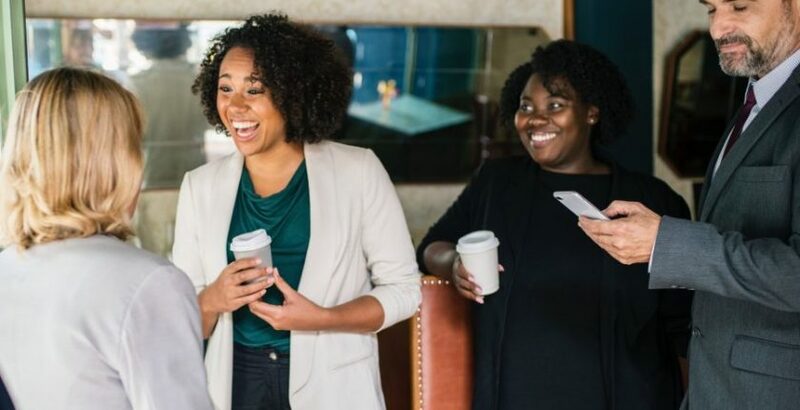 It also means that your interviewer will look up more at you, so they’ll see when you nod, smile, or otherwise non-verbally participate – which takes some of the stress off from having to come up with more to say. Keep your arms uncrossed and lean (non-invasively) towards the interviewer, and you will increase this sense of engagement. It will also help keep you alert so that you can respond meaningfully to what you’ve heard. The other factor in responding meaningfully is to listen. A lot of people worry about small talk because they don’t know what to say. But if your interviewers start the talking, they’ll do a lot of the hard work for you. That’s because you can listen to them, and bounce off the topics that they raise. This approach can help you to concentrate on what the speaker is saying, instead of getting stuck in your own head trying to think of something original to say next. The more attentively you listen, the better clues you’ll have about where to take the conversation. Already sounds easier? This new visual guide to making small talk contains a wealth of ideas on how to up your chit-chat game. Because employers don’t just want professionals – they want human beings! What Does Google for Jobs Mean for Recruitment?